If you’re thinking about including a gas fireplace in your homebuilding plans, or adding one to your existing home, read on. You may know already that once a gas fireplace is added to your list of desired amenities, it’s usually there to stay. And you’re not alone. According to the National Association of Homebuilders, fireplaces are one of the top three features new homeowners request. 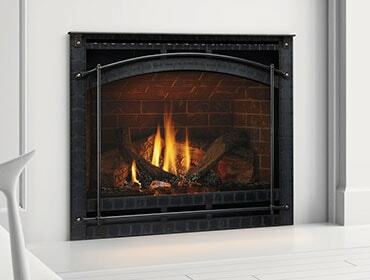 Gas fireplaces are factory-built fireboxes with specialized venting systems that can be direct vented or unvented. Direct vent gas fireplaces are the most popular because they are convenient and safe, with sealed combustion systems that protect indoor air quality by drawing outside air for the fire and expelling 100% of combustion exhaust and byproducts outside the home. Unvented gas fireplaces are open systems that draw upon indoor air for the fire, consuming oxygen while expelling exhaust and byproducts into the home.